As a native of the Czech Republic, Martin Dvorak moved to the United States with his family at the age of six already envisioning big dreams. 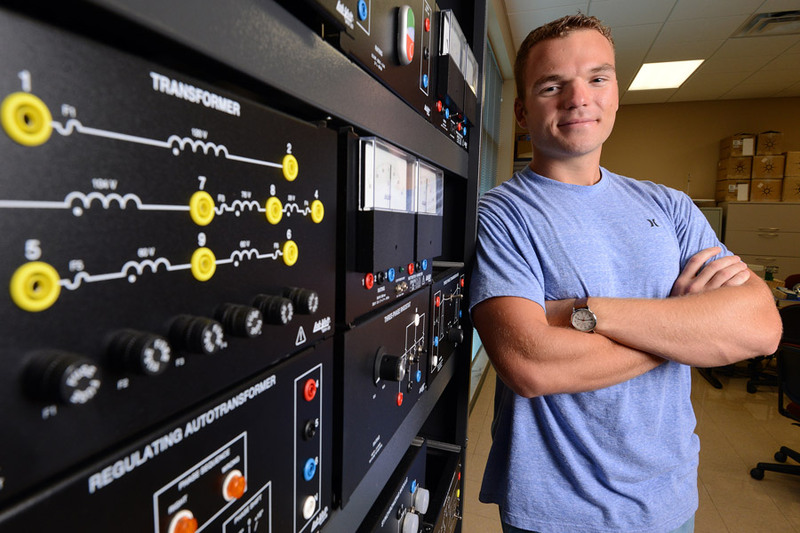 Now, the Florida State University graduate student is on the verge of achieving one of his most important goals: earning a master’s degree in electrical engineering this fall. Dvorak has traveled an academic fast track at FSU Panama City. He will complete undergraduate and master’s degrees in just five years. Along the way, he’s had unique opportunities to nurture a passion for engineering and design, including the chance to build a lifesaving warning device for scuba divers. Dvorak is excited by the prospect of working in a field of emerging technologies, such as artificial intelligence, machine learning and neural networks. They are expanding the boundaries of computational power and, as a result, enhancing understanding and the ability to make more accurate decisions. Dvorak said he grew up with an abiding ambition to help others, and his experience in the electrical engineering program has allowed him to meet that goal. Last year, he worked on a team of five students at FSUPC that collaborated with the U.S. Department of Defense and Interspiro, a company that makes gear for respiratory protection, to develop a new alert system for scuba divers. The team set out to create an improved device that would give divers accurate information in zero-visibility conditions about the amount of air in their oxygen tanks. In the past, Dvorak said, a lot of alert systems were designed with monitoring dials mounted near a diver’s waist to show pressure levels in tanks, but that kind of system would become virtually useless in thick, murky water. The FSUPC students decided to develop a device that clipped on a full-face dive mask and could be used in a head-up position, eliminating the need to look down at gauges. The housing included five LEDs in a row that illuminated when an oxygen tank was full with a pressure level around 5,000 psi. Every time pressure dropped 500 psi, an LED would start to blink and then turn off. That sequence would continue with increasingly urgent flashing until total pressure dropped to 500 psi and only a single LED remained lit — a clear cue that it was time to get to the surface. Records from 2015, the latest data available, showed 43 people were killed in diving accidents reported in the U.S. and Canada, according to the Diving Alert Network. The deaths were attributed to a variety of problems, including running out of air. The student-designers impressed Interspiro and the Department of Defense with the product’s design and functionality. Now, they’ve moved ahead with production of the warning device. Dvorak called the project one of his favorite college experiences. Dvorak also has worked to give others a boost during his time at Florida State Panama City. He joined the FSU STEM Institute and participated in its summer camps to teach children about electrical and computer engineering. In addition, Dvorak has worked as a graduate teaching assistant. He taught juniors some of their first courses in the electrical engineering program and provided tutoring help. In addition, he served on the FSUPC Student Council, where he led a committee that coordinated scholarships and awards. Dvorak’s disciplined and focused approach at FSUPC over the past five years has been productive and rewarding. He earned two degrees, developed a lifesaving new product for scuba divers, delivered valuable lessons for schoolchildren and learned lessons in student government service. Most importantly, Dvorak has reached those big dreams that were taking shape years ago when he emigrated from the Czech Republic.